LED Balloons - 30pcs Light Up Balloons Halloween Ghost Balloon with 4 Spooky Patterns, White Orange Purple Colour, Latex Balloon Glows Up to 12 Hours Lamps Party Home Garden Lantern Halloween Decors. Create the best Halloween haunt on theblock! 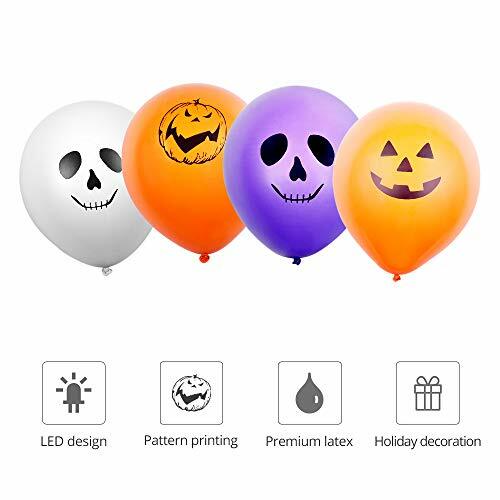 Look for Halloween party supplies and decorations for all your scaryparty ideas, these led balloons contain abright LED light inside three colour balloons with four ghost face on them.They're perfect for Halloween parties! Add colour and life to your party withthese count mixed colour balloons. The widevariety of colors is sure to go with almost any party theme you have in mind.Contains purple, white and yellow light upballoons with ghost faces - guaranteed to make you unique in Halloween. Simply pull out the tab to activate the LED light and easily inflated. Perfectfor all ages and occasions. Latex balloonsare made from 100% natural latex - not plastic. They are biodegradable, anddecompose as fast as an oak leaf in your backyard! Led latex balloons come from rubber trees, they are Earth-friendly!This latex balloons make the perfectdecoration for parties and Halloween celebrations. Choose these balloons tosuit your theme. These balloons are the perfect party forall ages and can be blown with your mouth, pump or helium. The dense partyballoons of various bright colours made of high-quality natural latex make theparty full of bright light up Halloween balloonand the hysteria they bring. They are reusable and can be safely used inchildren. We have a warranty, if the led balloondoes not meet your needs, our customer service will solve the problem for youfree of charge. LIGHT UP YOUR HALLOWEEN CELEBRATIONS - Halloween ghost balloons give out a bright glow and are effective. This easy-to-use version of the light up balloons makes a great party decoration or a brilliant lantern for trick or treating. Each pack contains several natural lights up balloons. Light balloon is fitted with an light that illuminates the balloon and glows for up to 12 hours. Simply pull out the tab to activate the LED light and Easily inflate the balloons using a balloon pump. GHOST PATTERN DESIGN - Halloween balloondecoration is hardly complete without some crazy balloon decoration. Bring a touch of spooky fun to your Halloween party with this pack of 4 LED light-up balloons with ghost faces from Halloween. Led ghost balloons are the universal party decoration ornament. For Halloween creepy themed parties, four different ghost patterns on those balloons give you a perfect Halloween atmosphere, and led latex balloons are also really easy to decorate. HEALTHY MATERIALS & SAFE USE - Made of natural rubber latex, LED latex balloons are made of 100% natural latex without any fillers or substitutes, light up balloon is very safe and healthy. They are made of high strength, high elasticity, uniform thickness and long air retention. The balloons have a vivid glow from an integrated bulb. These cheerful light-up balloons are perfect for family or children's parties, or for Halloween themed events. LIGHT UP YOUR CELEBRATIONS WITH MIXED COLOR LIGHT UP BALLOONS - Contains a mix of 3 coloured and four patterns that will make your party the brightest on the street. the led balloons are bright orange with a black face design and look just like ghost pattern. In order to ensure the highest possible quality, the producers use high-tech to dissolve the self-produced latex, dye and ink into the raw materials, making the colour and pattern of the balloon more vivid and the colour is more realistic. ADD FUN AND EXCITEMENT TO YOUR PARTY - Led ghost balloons can be used anytime, anywhere, for people of all ages. Let your children and everyone enjoy the fun of organizing each party. Latex balloons have been rigorously tested and selected manually, they are lightweight and easy to carry to outdoor parties. The led Halloween balloon is perfectly sealed and easy to operate, saving a lot of trouble. If you have any questions about this product by TOKKY, contact us by completing and submitting the form below. If you are looking for a specif part number, please include it with your message.